Living in a world full of fascinating visual elements and intriguing macro-organisms often results in people forgetting the most abundant group of earth’s inhabitants— microbes. Microbes are not only the most abundant and diverse group of living organisms but are also, in my personal opinion, the most fascinating. Whether it be the Demodex brevis that colonize human faces or the rhizobia that live in our soils or the Thermus aquaticus that live in the depths of Yellowstone, microbes are inescapable and responsible for endless biological processes. One group of bacteria, rhizobia, are soil-dwelling and underappreciated powerhouses of agricultural productivity. These bacteria form a specialized relationship with leguminous plants (soybean, bean, lentils, peanuts, etc.) in which they supply nitrogen, a globally limiting resource, in exchange for carbon. When undisturbed, this interaction naturally increases soil nitrogen content. Agricultural soils are frequently nitrogen limited which causes farmers to deposit approximately 80 million tons of nitrogen fertilizers on agricultural fields each year! This practice has resulted in increased crop yields at the expense of the environment. Toxic algal blooms pollute water sources, microbial communities have been destroyed, fossil fuels are burned to produce the fertilizers, and gaseous nitrogen compounds are released into the atmosphere as consequences of modern fertilizer production and use. Fortunately, the relationship between legumes and rhizobia offers an opportunity to offset the excessive use of fertilizers and begin shifting away from these environmentally detrimental practices. Medicago truncatula, a model legume on which I conduct research growing in two different types of growth containers. The fully encased one (test tubes) provides sterile conditions for assays that require a more controlled environment. In this relationship the host legume provides the infrastructure in the form of specialized organs known as nodules. Inside these nodules live the hardworking rhizobia. The plant nodules serve as a protected space for the microbes to reproduce and expand as they complete the energy expensive task of converting N2 to NH3. Years of evolutionary pressure has resulted in a very tightly controlled balance of resource trade. However, as with most relationships there exists opportunities for trouble— in context of this mutually beneficial relationship the rhizobial partners have the opportunity to take more resources from the host plant while supplying comparably less nitrogen. This act has been termed “cheating.” Cheaters are problematic since they threaten to destabilize the long-established and important relationship; a reality that would further strengthen our dependence on nitrogen fertilizers in the agriculture sector. 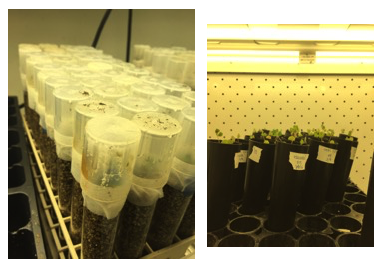 In Dr. Maren Friesen’s lab, I aim to elucidate molecular mechanisms of this resource trade between legumes and rhizobia. My work focuses on understanding how host plants are able to differentially recognize and respond to rhizobial partners of varying effectiveness. Developing an understanding of these response and control mechanisms is critical to understand how microbes are able to exploit their hosts and how external pressures are driving the emergence of cheaters. As a native of southwest Missouri, ranked 6th in soybean production in the U.S., I spent most of my life surrounded by agricultural fields. Traveling to school frequently involved getting stuck behind a tractor when planting season arrived. Future Farmers of America was the largest student organization and roughly half of the student population had milked a cow before the age of 10. Although charming and hardworking, small agricultural towns are often times inherently (but unintentionally) anti-science. STEM education was severely lacking and evolution was a dirty word capable of eliciting dramatic arguments and endless frustration. Because of this, I loathed the idea of working in agriculture. Upon graduating high school, I entered college as a Biochemistry major with no clear idea of what “biochemistry” was nor what I could do with it. I was fortunate enough to land a job in a plant biochemistry research lab. There, they focused on understanding basic mechanisms of plant immune responses to pathogenic bacteria. That job set up the stage for my future research interests. I discovered the complex world of molecular signaling events and microbial associations. I learned about the co-evolution of organisms that commonly associate and how these associations drive the development and establishment of complex features of host-microbe interactions. I fell in love with the unseen world. Years later, these experiences still serve as the foundation for the questions I ask and the topics I find intriguing. In the Friesen lab, I hope to better understand how hormones, specialized proteins, and various other plant derived molecules serve as regulatory components for the unique relationship leguminous plants have with the microbial world. Further developing our understanding of the regulatory mechanisms will both shed light on the co-evolution of legumes and rhizobia as well as the factors that threaten to destabilize this biologically important relationship. This entry was posted in BEACON Researchers at Work and tagged agriculture, BEACON Researchers at Work, Biological Evolution, coevolution, plant biology. Bookmark the permalink.